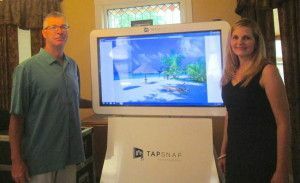 TapSnap, a modern take on the photo booth, has come to Park Ridge and franchise owners Michael and Pam Carrico are hoping to turn the concept into a full-time business. The device, developed by a Canadian company with franchises throughout North America, allows users to take pictures, add accessories and backgrounds, and either print the results, email them or send them via social media. Neither Michael nor Pam had much experience with photography before starting the franchise. Pam works as a speech therapist for Des Plaines schools, and Michael is a director of rackets at a tennis club on the North Shore. But the couple had been looking to start a business, and the concept behind TapSnap intrigued Michael. At the beginning of the year, he attended a seminar at the company’s headquarters in Vancouver where he learned how to operate the machine and set up a business around it. TapSnap is a large touch screen mounted on a stand, with a professional-quality camera on the right side and a printer concealed in the stand, under the screen. In a demonstration, Carrico showed how one could use the touch screen interface to take a picture and digitally add props and accessories from the selection of images stored on the device. Users can change image size and rotate them through simple touch. As part of the demonstration, he took a picture of himself, selected sunglasses and a hat, shrank them to fit his face and put them on. Carrico said for events, they bring a chroma key, which allows them to add backgrounds like a tropical island and the Las Vegas skyline. Once the photos are ready, users can print them, send them digitally or instantly share them on social media. The couple did several “practice” events in mid-February. In March, they officially debuted TapSnap at a fundraiser at their children’s elementary school. Since then, the couple have been able to attract clients continuously. “We’ve also had a surprise party, and we booked a wedding for next year already,” Pam Carrico added. The clients come from a number of sources. The couple said the biggest challenge is balancing the business with their full-time jobs. “Luckily, a lot of our events are on evenings and weekends, so that helps,” said Pam. By their own admission, neither of them is tech-savvy, and technical difficulties do occasionally arise. But they said thanks to round-a-clock tech support from TapSnap, those issues can be resolved quickly. Ultimately, the couple hope to reach the point where they will be able to focus on TapSnap full time. The fact they enjoy doing it as a big part of it. “I just think that, after the hectic part of getting the machine set up, it’s really fun,” Pam said. Source: Studenkov, Igor. "Park Ridge couple hopes to turn modern photo booth into full-time business." Park Ridge Herald-Advocate, August 11.